Ethereum Code is a new algorithmic cryptocurrency trading platform that specializes in trading ETH. There’s quite some controversy around the crypto robot platform. One of the reasons for that is the little information that can be found on the application. But, hey! That’s why we are here. We decided to test the Ethereum Code app, and share you our take on this crypto robot software. Let’s dive in! Ethereum Code is a crypto robot app that harnesses the power of algorithmic trading bots and takes advantage of the volatile nature of the cryptocurrency market. As digital currencies tend to be volatile, the Ethereum Code app uses its bots to take advantage of that and generate profits for the user fully automatically. It means that after you do an Ethereum Code sign-up, you don’t have to deploy your own technical analysis, indicators, and strategies. The application works as most of the crypto robot solutions: you don’t need to do anything besides monitoring the performance of the bots after setting them up. But before showing how the application works, let’s analyze a few things first, including general information about the service, the Ethereum Code website, and whether the platform is legit (by analyzing the site of the service – we will draw further conclusions in another section where we show you our impressions after testing the app itself. When we were on the Ethereum Code website, the first thing we’ve seen is a video showing us luxury cars and mansions as well as dream holiday sites. In the video, the operators of the Ethereum Code argue that regular 9-5 jobs won’t make people rich due to the low salaries, high-interest rates, and growing taxes. The Ethereum Code team claims that there’s a solution for all this that guarantees a daily income of over $3,000. And this solution is Ethereum Code, a state of the art auto trading software. Then a user stating that he had made thousands of dollars on autopilot with the app. You can see other testimonials in both the video and on the website (if you scroll down). According to the video on the homepage, Ethereum Code is currently holding its beta test, and the operators invite users for testing. They claim that only limited places are available. However, we couldn’t verify this as companies often use the “limited” word to emphasize scarcity. The video also shows the creator of the application and the CEO of Ethereum Code, Mark Weston. According to Weston, the idea of Ethereum Code came from a time when he was working in a 9-5 office job at a multinational software corporation. He was intrigued by one of his colleague who was an early Bitcoin investor and made thousands of dollars with his investment. Missing the “Bitcoin boat,” Weston decided to get into automated cryptocurrency trading. According to the video, he created his own application – Ethereum Code – as he did not have success with other platforms. The operators on the Ethereum Code website stated that their app uses cloud tech to operate every day in every hour throughout the year. There are no downloads required to use the application. Furthermore, the team claims that their platform is “lightning fast” due to the state of the art algorithms they use to scan the markets numerous times in every minute in order to find opportunities for cryptocurrency trading. The operators of Ethereum Code also claimed on the website that the profits users make via the crypto robots are completely tax-free. However, you should take this statement with a grain of salt. Every country’s government taxes both traders and investors so it there’s a chance that you have to pay taxes for using an automated cryptocurrency trading platform like Ethereum Code. Before whether to pay taxes after your Ethereum Code profits, we recommend you to consult with an accountant first. So, analyzing all this information, we believe the operators of the Ethereum Code app seem legit. However, you shouldn’t make any of the promises as a guarantee. The Ethereum Code team stated there’s a guaranteed over $3,000 of profits a user can make by using the crypto bot platform. However – knowing that $3,000 a day would make you a millionaire by the end of the first year -, you shouldn’t take that promise as granted. The reason for that is that every trader is different and the market changes minute by minute. While it is possible to make $3,000 in a day in a bull market, it does not mean that you will get the same amount of profits the other day or when the cryptocurrency market crashes. What Weston states regarding Bitcoin is true. The coin has made numerous people rich who were early investors or just invested in the right time. There are also traders who have made serious profits by only trading cryptocurrencies on a daily basis. We can also confirm the fact that a part of automated digital currency trading platforms are not profitable as some of them are operated by scammers while others have low-performance bots that do not provide the income most users are looking for. So, judging by only the website, we don’t think that the Ethereum Code system is a scam. On the contrary: it seems like a legit service. You will know more about this in another section in our Ethereum Code review where we show you the results from testing the crypto robot platform itself. Yes! Based on our review of both the information found on the Ethereum Code website as well as our results from testing the app, we think that this crypto robot platform is a legit service. The operators of the Ethereum Code do not require any payment information from you. Instead, they are using a broker to handle the payments. Therefore, you do not have to provide your credit card or PayPal details when using the service. If you are a beginner trader, we recommend you to read user guides and test the demo trading platform (we advise every trader to do this) before using the live trading app of the crypto robot solution. In case you are new to Ethereum Code, we recommend you to deposit no more than $250 as your initial investment. This way, you can minimize your losses if the bots make unprofitable trades. Ethereum Code is founded by the former accountant Mark Weston. The founder and CEO of the service worked at a major multinational software corporation. However, he left it to become a cryptocurrency trader himself. After he had tried multiple automated digital currency trading platforms, he realized that a part of them wants him to lose money (he may have referred to scammers). According to the video found on the Ethereum Code homepage, Weston then decided to create his own algorithmic cryptocurrency trading platform that focuses mainly on Ethereum – yes, the app we are reviewing now. Now that you know lots of info about the website and the creator of the crypto robot platform, it’s time to test the Ethereum Code app. So, we went with creating an account at the service. We have used the demo platform of the service that simulates live trading with virtual money in the same market conditions and trading environment. The operators of the Ethereum Code software had mentioned on their website that the app is working on the cloud. We can confirm that – you don’t need to download anything to turn on the platform’s robots. You just need to create an Ethereum Code account, head to the demo trading platform and turn them on. Then the cryptocurrency bots will do all the trading for you. You only have to carefully monitor their performance (which is crucial if you are using the live trading platform). What’s great in Ethereum Code that it does not need you to develop your own strategies and settings to start the bots. Other automated cryptocurrency trading services may require to set one or both of the aforementioned options, which can sometimes become time-consuming. On the other hand, when you are using the Ethereum Code app, the only thing you need to do is one click. The operators of the platform have already set up their own settings for every user, which have worked for them in the past (and hopefully will work in the future too). So, here are our results from testing the robots via the demo trading platform of Ethereum Code. From 22 trades, we have generated profits on 15 and lost money on 7. That’s a success rate (the metric showing the percentage of trades that resulted in profits) of almost 70%, which is good. Although, if we have spent more time testing the robots, the success rate could be either lower or higher than that. Please note, that it is not guaranteed that you will get our success rate or another rate mentioned in the testimonials from past customers. The market changes minute by minute. While you can win more trades in one week, you can also generate more losses in the next. We can say we were quite satisfied with the performance of both the robots and the Ethereum Code platform in general. We haven’t had a single downtime or an error while the bots were trading cryptocurrencies. We think that the Ethereum Code app is a legit automated cryptocurrency trading solution. Therefore, we have compiled a step-by-step tutorial that will guide you through the processes of registering an account, testing the platform’s bots via the demo trading app, depositing funds, and live cryptocurrency trading. Along with the information, we have included images too that will help you to see the “big picture” when you are using the Ethereum Code application. Ethereum Code is not the only legit platform though. Visit our bitcoin robot page to see all your options. To trade on the Ethereum Code platform, you need to first create an account at the service. To do that, navigate to the homepage of the automated cryptocurrency trading app. You’ll see a short form on the right side of the page with the headline “Start Now.” Fill it out with your name and email; then the Ethereum Code website will take you to the next page where a new form will appear requesting further details from you. Provide all the information, including your full name, desired password, phone number, and country of residence. When you are done, proceed to the next step. So, your Ethereum Code account is now officially created. Well done! But, before funding your account and using the live trading platform of the service, it is essential to test the bots of the algorithmic crypto trading app – as we did in our review. While you can have basic information on the performance of the Ethereum Code cryptocurrency robots from our review and customer testimonials, it is recommended to test them for yourself too. We mentioned the reason for that before: the market changes every minute and every trader gets different results when testing the crypto robots. To be successful when trading cryptocurrencies via the platform’s crypto bots, we recommend you to set your goals and analyze the performance of the Ethereum Code app according to those. To use the demo trading platform of Ethereum Code, click “Go to Demo” on the left side tab. The platform will take you to a new page that you can use to test the algorithmic cryptocurrency trading bots. At first, you’ll see a message stating that your account has been credited with $1,500 worth of virtual funds. You can use that to simulate trading by using real market conditions without any risks. To turn on your bots, you have to click the red “Off” button under “Auto Trading.” The bots then will start trading cryptocurrencies automatically within a few seconds. We recommend you to leave the bots on for at least 20-30 minutes. Then analyze the performance of them and that whether they meet your goals that you have set up previously. If you are satisfied with the results, proceed with funding your account. The next step is to deposit funds into your Ethereum Code account. If you have not done already, click “Go to Live” on the left side of the page. The site will take you back to the live Trading Room of the app. Now, click the “Deposit” button under the “Current Brokers” section. 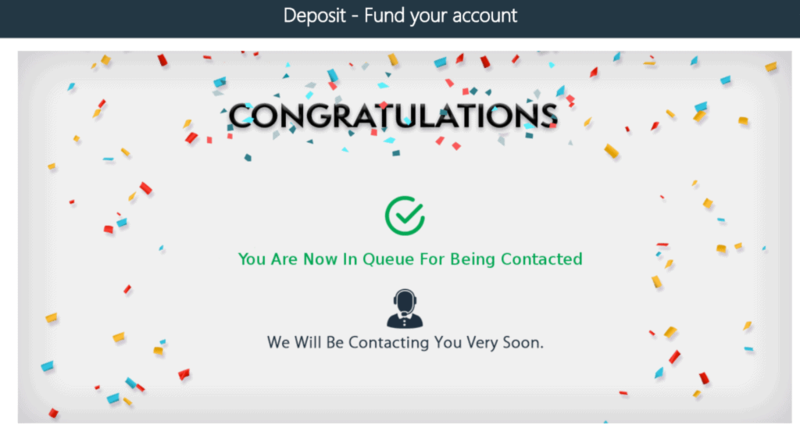 A message will appear stating that you have initiated the deposit process and the administrators of the service will soon contact you with more information on how to fund your account. Wait for their message (it shouldn’t take longer than a few days) and follow their instructions carefully. You can start using the live trading platform of the crypto robot app as soon as your funds are credited on your account. Starting the bots on the live trading platform is similar then it was when you were using the demo application. You need to find the red “Off” button under “Auto Trading” and click it. The bots will start automatically within a few seconds. Please make sure that you are carefully monitoring the performance of the app as you are now trading with real money (not like at the demo platform). Happy trading! What makes this crypto trading software special? Now, that you know almost everything about the Ethereum Code app, let us highlight some of its features that make the algorithmic cryptocurrency trading platform unique. Firstly, when we were using the application, we were surprised how easy it is to use it. Therefore, we think Ethereum Code is one of the most beginner-friendly crypto robot platforms out there. We can also say that Ethereum Code is legit. Unfortunately, we can’t say the same about a significant part of the automated crypto trading apps. The information looks solid on the website, while we were satisfied with the bots (including the performance) when we were testing the application itself. Let’s summarize all the crucial parts of this review to draw our conclusions. Firstly, we have taken a look at the Ethereum Code website, which we think is quite okay. There are no false promises as well as unrealistic statements (unlike what we have found on some competitor sites). There’s a part about Mark Weston, the creator of the app who has founded Ethereum Code to take advantage of the growing cryptocurrency market, and especially Ethereum itself. The app is currently in its beta stage, so the access is free for everyone. While we were testing the application, we got solid results with a success rate of almost 70% for the bots. We had no issues – Ethereum Code’s crypto robots work flawlessly, they have started trading cryptocurrencies within a few seconds. How much can I make with Ethereum Code? Neither we nor the operators or any past Ethereum Code users can accurately predict how much profits can you make with the automated crypto trading app. The reason for that is that every trader is different. While one makes thousands of dollars in a month by trading coins via the crypto robots, another user can generate only a few bucks in the same period. Also, the market changes at every minute. While the Ethereum Code bots can make profits in a bull market, it is a question that they can do the same when the crypto market crashes. What we know though that we had great results when we were testing the automated trading platform. Hopefully, you’ll have too. To verify the profitability of the platform, we always recommend our readers to test the demo trading app of every crypto robot service first. You should do the same with Ethereum Code. Why did Mark Weston decide to trade ETH with Ethereum Code? According to all the information we have read on the Ethereum Code website, the founder of the service – Mark Weston – has decided to create a bot platform for ETH as he found that Bitcoin is not that profitable than the aforementioned coin. Weston also stated that he finds Ethereum to be more innovative and that its blockchain offers more security than Bitcoin’s. Also, Weston has missed the “Bitcoin ship” so he decided to set up an automated trading solution for another coin, Ethereum. Can this app accurately predict the price of Ethereum? The short answer is no. Crypto robots can’t provide an accurate Ethereum price prediction. This includes ETH-specialized solutions, such as Ethereum Code. But not just the software, even expert traders and all-star investors are unable to predict ETH’s price in the short term. While an approximate Ethereum price prediction is possible in the long term by experts, it does not guarantee that the future price of the coin will go in the way the aforementioned experts think. 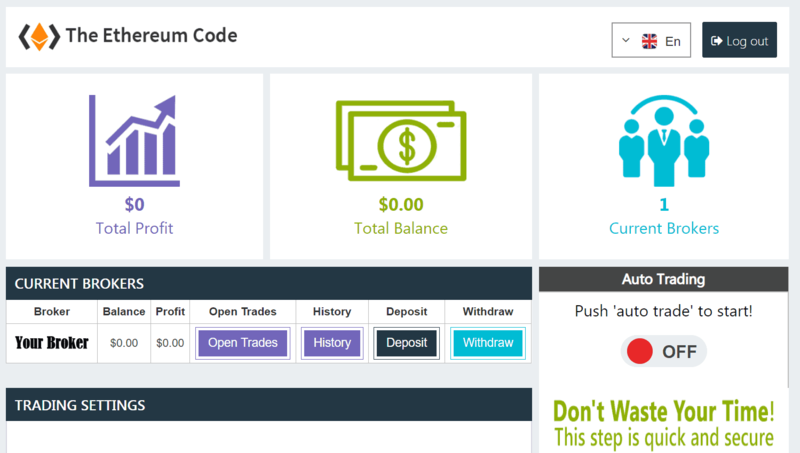 Bitcoin Code is a very similar automated cryptocurrency trading platform to Ethereum Code. In addition to being one of our top-rated crypto robot apps, Bitcoin Code features an easy-to-use application, a fast registration process, and high-performing bots that will do all the trading for you. Don’t forget to check our Bitcoin Code review! CryptoSoft is another featured cryptocurrency robot platform. When we were testing the app, the hard-working bots of the app generated us great results while trading coins. The registration process is easy – you can create your account in two steps. Also, the platform itself is very beginner-friendly, so it is suited for all audiences. We have compiled a CryptoSoft review recently, which is worth checking out. Yeah Ethereum Code is legit, I have used it myself. This cryptocurrency robot is very easy to use, although sometimes I made some loss when I trade it is still a better way to make quick money. The ethereum code is a very good software and I made double of my investment in the first two hours of trading with the robot. How much do you recommend for a newbie to start with? Is the technology behind this cryptocurrency robot accurate? Hello Beatrice, we highly recommend you to start with the minimum deposit and gain some experience in crypto trading. After gaining experience you can increase your investments for larger profits. As per our experts, the robot’s algorithm is more than 88% accurate. The ethereum code is known for its simplicity and it’s ability to give better gains. It is legit and it is very easy to use. What is the best Cryptocurrency to trade with the ethereum code software? Hello Jack, the Ethereum Code is legit and easy to use. It uses thorough market prediction algorithms to determine the best possible operations to make. The Ethereum code only uses trading pairs of Ethereum for trading, so, you don’t have to worry about choosing the right cryptocurrency. 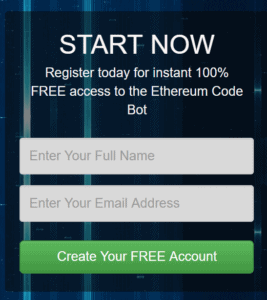 The ethereum code is a superb and nice cryptocurrency robot that is very great and good for trading. I am very happy that you will be able to make a very good kncome if you use this bitcoin. Just give it a trial and you will be happy that you made such an investment. What is the best Cryptocurrency to trade with this bitcoin? Is it safe to invest in this software? I will recommend this to everyone who is looking for a simple, easy and convenient way to make good cash through ethereum. Although this robot, Ethereum code is still in its beta stage it has been working greatly and I made some cash while using it so you can make profit yourself as I am also new to the system, yet I was successful. What is the smallest amount that can be invested in this software? How recommendable is this robot? Is the withdrawal system okay?